Tattoo culture has seen a surge in popularity over the past few decades, and old stigmas once associated with the practice are fading away. As this art form becomes increasingly accepted by mainstream culture, it continues to evolve in interesting ways. In the past, tattoos were perceived almost exclusively as indicators of affiliation with the shady world of bikers, delinquents and rebels. Today, they fulfil a far wider variety of functions. Tattoos are worn like statement pieces or jewelry by some individuals, while for others, having a tattoo is comparable to owning an exquisite painting. 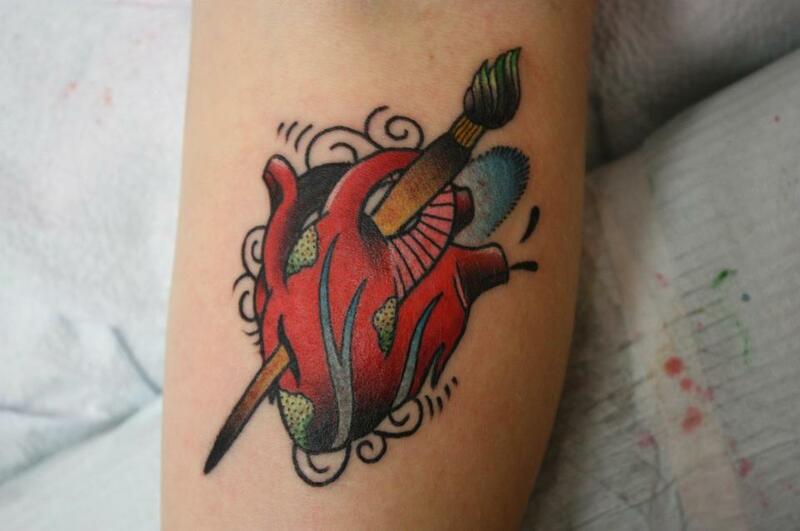 Meaningful phrases and imagery are popular tattoo subjects, as they can permanently capture ideas, memories, or beliefs. As is the case with fine art, some people will appreciate tattoos from afar, but do not want to commit to ownership. At Norman Felix, we specialize in contemporary fine art, but we also love to branch out and explore trends outside of that. This post is meant to pay homage to some styles, artists, and aesthetics in the world of tattooing that we particularly enjoy. It is impossible to cover such a broad and complex subculture in a single post, so this is just a roundup of our personal favourites. We hope you enjoy this selection of drawings on the ‘living canvas’! Sailor Jerry flash sheet depicting a variety of pin-ups. The first thing that comes to mind when one thinks of tattoos in Western culture is the traditional, “old school” style, the king of which is Sailor Jerry. This look emerged in the late 1920s and is still referenced and replicated frequently to this day. It often features patriotic as well as nautical imagery (ships, anchors, sparrows, and of course pin-ups to name a few). Images are boldly outlined, and highly stylized. Depictions of women are cartoonish, favouring ample curves, large bosoms, and very basic facial features. A neo-traditional tattoo done by Pete Belej (Toronto, ON) – the key stylistic elements of heavy outline and relatively simple graphic representation are evident, but the subject matter is contemporary. This artist has made a genre his own: note the extra embellishments around the image as well as a trace amount of abstraction. Realistic tattoos are extremely challenging and risky, and they can (if executed by the wrong hand) lead to disaster. There is no room for error in the process of tattooing something true-to-life, especially a portrait. Imagine the stress of trying to replicate the precise likeness of an individual on a surface that is moving, swelling, bleeding and breathing! 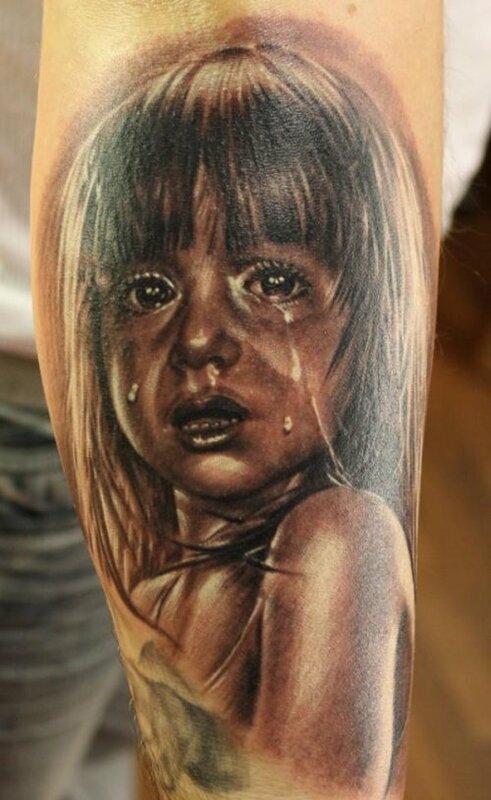 A breathtakingly photorealistic tattoo by Zhivko Baychev. A biomechanical tattoo by Guy Aitchison. If you love science fiction, you will probably appreciate this style. Biomechanical tattoos became popular several decades back, around the release of the first Alien movie in 1979. H.R Giger, who designed many of the creatures from the Alien movies, can be credited as a major source of inspiration. This aesthetic involves intertwining parts of human/organic forms with technological imagery. For example, replacing veins with tubes or wires, or throwing in some cogs and fuses to create an android-like image. Often these tattoos appear three-dimensional and futuristic. They can be dark, gritty, black and white pieces, or can feature explosive shapes and electric colours. Biomechanical tattoo by Adrian Dominic. Traditional Japanese tattoos are done painstakingly by hand, as opposed to by machines, and typically cover large areas of the body. 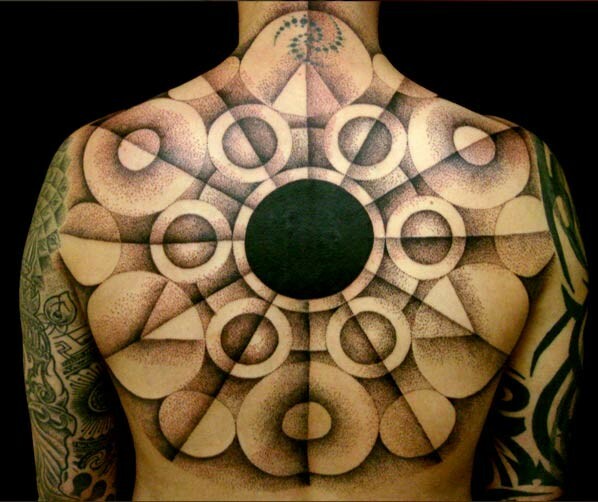 In some cases, the entire body can be covered with a single design. Many of these designs are extremely intricate and are based upon traditional metaphors, stories, or fables. While the range of imagery is nearly infinite, some of the more popular designs include lotuses, waves, koi, and dragons. Each symbol (or combination of symbols) carries meaning. For example, a koi fish transforming into a dragon symbolizes overcoming adversity or personal struggle. Much care must therefore be taken in selecting the design for this type of tattoo, so as to avoid accidentally communicating the wrong message. A traditional bodysuit by an artist known as Shige. Who needs clothes when your body is covered in this beautiful, intricate decoration? 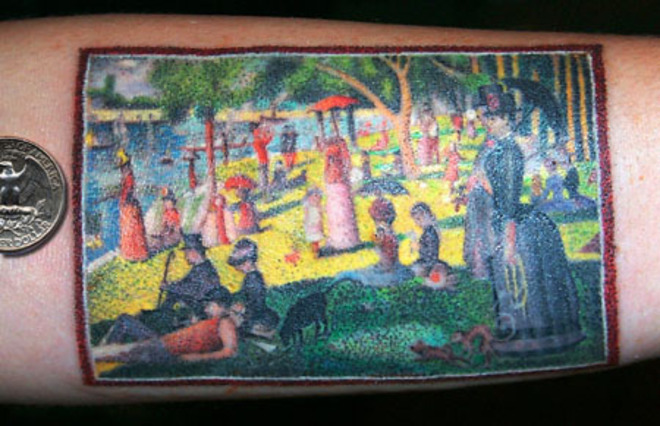 Tattoo artist Anil Gupta created this incredible reproduction of “A Sunday on La Grande Jatte” by Georges Seurat, a Nineteenth-century artist famous for his pointillist renderings. Pointillism is a challenging feat for any tattoo artist and subject to undertake. Tattooing on skin takes much longer than drawing on paper, and anybody who has worked in pointillism (which involves the creation of an image using tiny individual dots) knows that this style is insanely time consuming. This form of tattoo is demanding and labour intensive, and precision is critical. The image above could easily be mistaken for an optical illusion, but it is real! This incredibly detailed design is by Cory Ferguson, a true master of tattoo pointillism. Tattooing is an art form that requires talent, dedication, and skill, and those who have mastered it deserve recognition and respect. There are thousands of world-renowned tattoo artists who have cult-like followings comparable to those of many popular fine artists. We look forward to seeing what new directions this art form takes in the future! 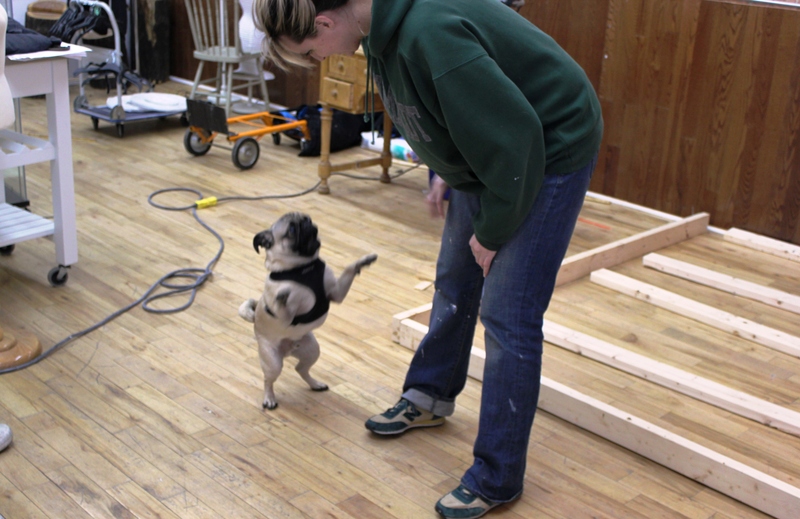 Erin and Erol, building walls. 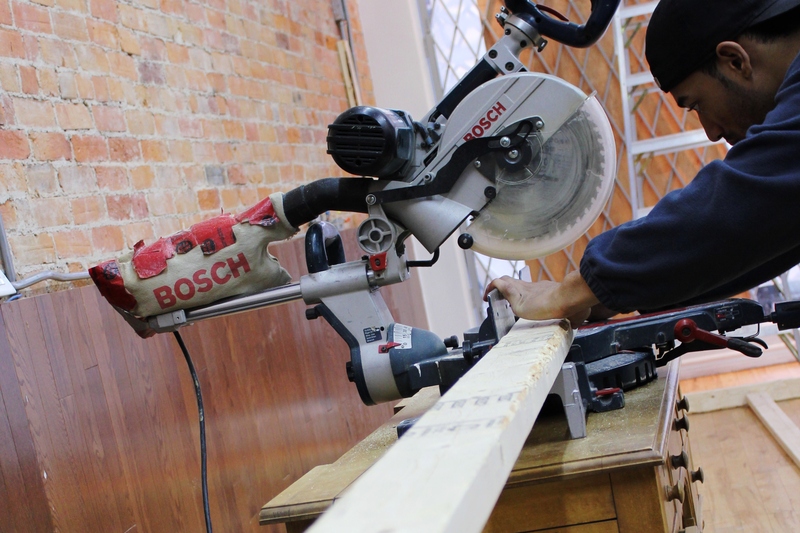 Norman Felix Gallery is renovating! We are giving Six20Seven a facelift, adding amenities, building our muscles, and putting up a new sign outside. The best part is that we are putting in a coffee & juice bar component, because we aim to satisfy not only your eyes and hearts, but also your tummies and caffeine addictions! The musical and visual arts respectively are two of the most fulfilling and popular forms of artistic expression practiced today. They are deeply related, and for some artists, they can work in harmony to produce works of art that stimulate both visually and aurally. 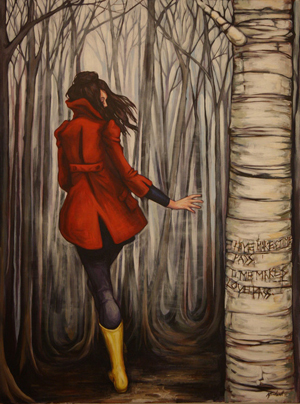 Iranian-born artist Yashar Nazarian (who now resides in Canada) creates unique pairings of original paintings and piano compositions. The two are intended to be experienced and enjoyed simultaneously, each enhancing the depth and flavour of the other. Music alone is capable of making a profound impact both consciously and subconsciously upon listeners, who experience correlated emotions, moods, and thoughts. As demonstrated throughout time, an art-muse relationship exists between music and visual art, guided by commonalities in aesthetic, philosophical, and socio-cultural principles. This relationship is evident between work by Andy Warhol and the Velvet Underground, Peter Blake and the Beatles, and Rick Griffin and the Grateful Dead. But how exactly do the aural characteristics of music affect visual art? A recent study conducted by fourth-year Ryerson University student Cassandra Tino examined the influence that musical input has upon the creative output of fashion illustration students. According to her findings, music has the ability to evoke emotional responses which affect concrete creative decisions such as media selection, color choices, and compositional elements. A preference for more fluid mediums such as watercolours applied in many cases, as well as the use of colors with obvious psychological connotations that matched the mood of songs. These creative decisions together lead to the production of art pieces which have been composed with specific stylistic correlations to the music. 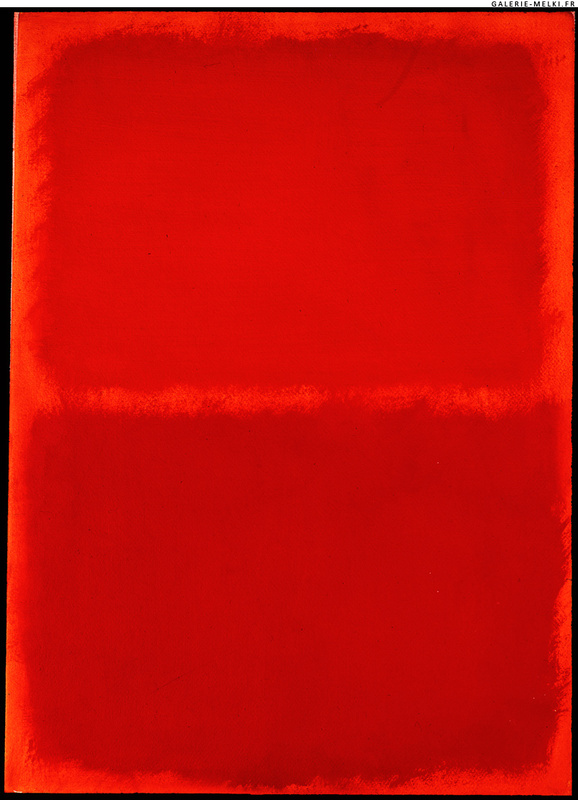 A "Colour Field" painting by Mark Rothko. These paintings were attempts to capture the "sublime", an Abstract Expressionist term referring to primal, overwhelmingly powerful emotion. Yet a broad space for variance and individuality remains, despite these guiding principles. Music creates different moods for different people. What may sound beautifully haunting to one person’s ears may be unbearably sad to someone else’s. A song which causes one individual to feel energized and excited may make someone else feel anxious or annoyed instead. Beyond variations in musical taste and experience, there is also space for variety in the approach to expressing a shared emotion. Certainly we would all choose different colours and shapes to reflect the mood of music we find spine-tinglingly lovely. Or would we instead use the same light colours, soft shapes, and open spaces? To reflect heavier emotions such as despair, loss, or regret, would we all choose the same palette of dark and muted colours? There is no single formula for expression, nor is there one for experience, and these compose the very foundation of artistic creation. They are subjective, elusive, transient – experiences can be distorted and forgotten, and expressions misunderstood. Herein lies the beauty of artistic creation, which strives to capture that which is too elusive and transient to ever be captured, but in so doing generates wondrously new emotional experiences for those who behold it. In a competitive world overflowing with creative talent, artists who strive to turn their passion into a fruitful career generally try to elevate their work beyond the level of simple “eye candy”. The reality of the game is that an artist’s public persona matters just as much as (and in some instances more than) the actual work that they produce. The phenomenon of an artist’s public identity propelling their career is not a novelty. 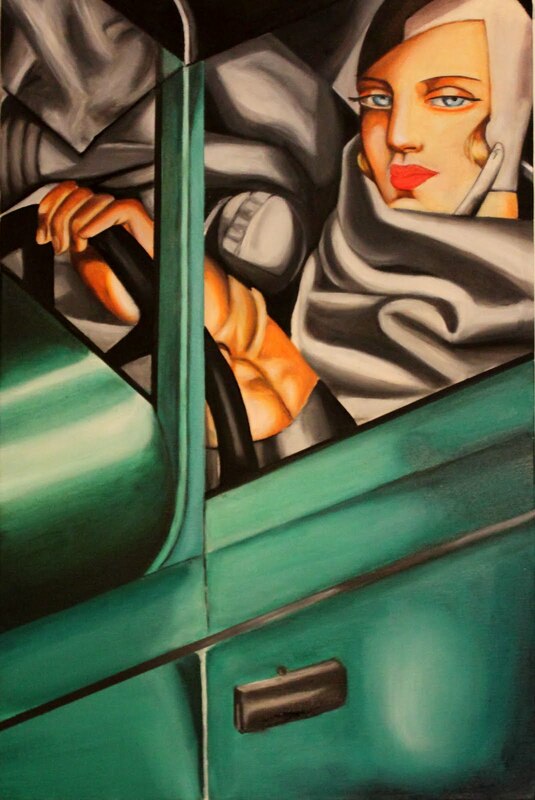 Michelangelo, Tamara de Lempicka, and Andy Warhol were all experts in cultivating exciting and appealing exterior personas, and enjoyed considerable success as a result. In today’s media-saturated society, this approach has become more powerful than ever before. Yet there has been a significant shift in who holds the power, and artists are no longer the main proprietors. While the potency of the public persona is steadily increasing, the artist’s role in shaping it is on the decline. 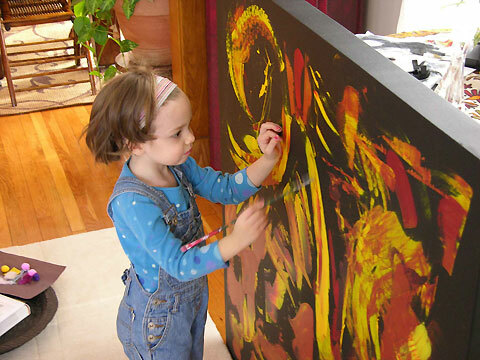 Consider the Marla Olmstead controversy, outlined in the brilliant documentary “My Kid Could Paint That”. 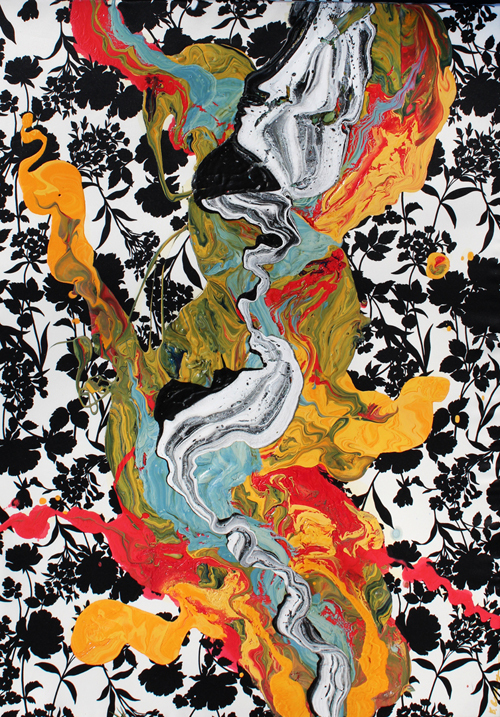 Marla is an incredibly young abstract painter who creates artwork that stylistically and creatively outshines that of many of her contemporaries (who are five to ten to twenty times her age). During her lightning-speed rise to fame at the insanely young age of three, people would gush in interviews about how fabulous Marla’s work was and how phenomenal it was regardless of the artist’s age. This changed however, following a CBS “60 Minutes” interview with her family which strategically implied the possibility that her father (also an abstract painter) had doctored her work. The public perception of her art became permanently tainted by suspicion. Although her work remains popular, her public persona is entrenched in drama, and in a sense has lost its innocence. If consumers and collectors were judging her art based on its aesthetic merits alone, this controversy would be irrelevant – the art itself has not changed, regardless of whether or not it was the fruit of a collaborative effort. Collaboration is not plagiarism. The perceived value has only been impacted because collectors and consumers were not simply purchasing pieces of art, but were investing to become shareholders in the mythology of the three-year-old miracle protégé. 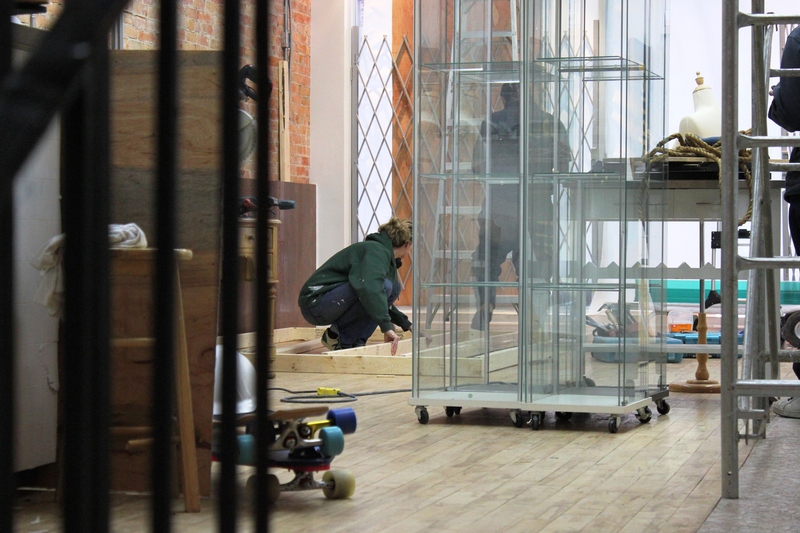 They were investing in Marla Olmstead herself, not just her work. Marla Olmstead working on "Zane Dancing"
Art-focused reality television has recently been introduced, via Bravo Network’s “Work of Art” and its upcoming Canadian counterpart “Art for Love”, which will feature one of our own NF artists, Bryan Belanger (go Bryan!) On one hand, the potential for these programs to turn previously unheard of emerging artists into household names is hugely exciting. On the other hand however, the fame that follows from participation in this type of program can be a risk because the television network(s) alone will have the greatest hand in determining how artists are portrayed, by means of carefully editing their interviews and activities to convey an entertaining but not necessarily authentic caricature. An artist’s failure or success will therefore be only partially the result of their talent or skill level. On “Work of Art”, very few detailed shots of the contestants’ actual pieces are shown. Instead, an overwhelming amount of time is spent documenting their attitudes towards the challenges assigned to them, their interactions with one another, their personal quirks, and life dramas. It is interesting to note that in both seasons of the show, all of the top finalists are physically attractive individuals. The older or less conventionally attractive artists are eliminated relatively early. Does the individual with the most marketable image prevail in “the search for the next great artist”? The examples mentioned above raise several questions: does mass media exposure and the inevitable manipulation of artists’ personas truly benefit them (“any publicity is good publicity”), or does it instead have the power to wreak havoc on their careers? 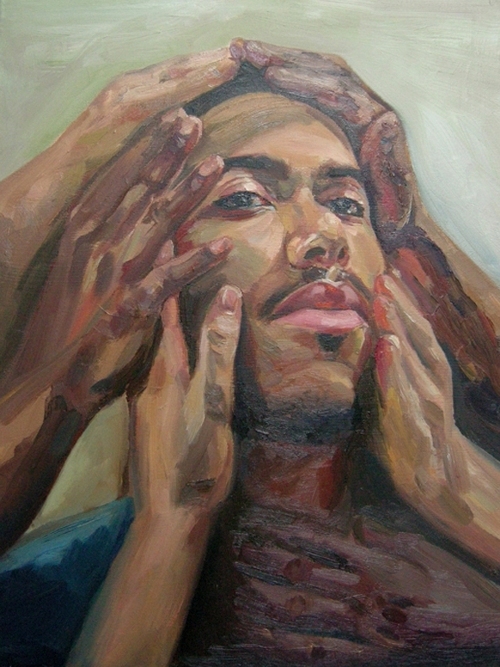 Should the identity of an artist be relevant to the perceived quality or value of their work? Do the personalities of contestants on art-oriented reality television outshine the merits of their art? Is this unfair, or simply the way to “play the game” to become commercially successful today? One truth stands despite these questions: it is more crucial than ever for artists to invest as just as diligently in crafting their public image as in creating their masterpieces! On the main floor of Six20Seven, Creatures Creating is currently hosting an Indie Jewelry Market to showcase the unique work of independent jewellers from in and around Toronto. 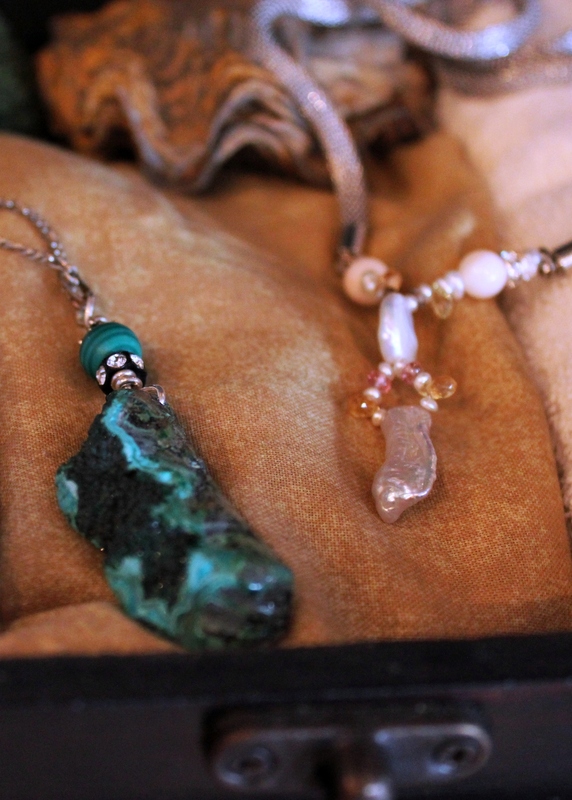 Many of the displays feature one-of-a-kind items such as recycled antiques, precious stones, and carved wooden pendants. 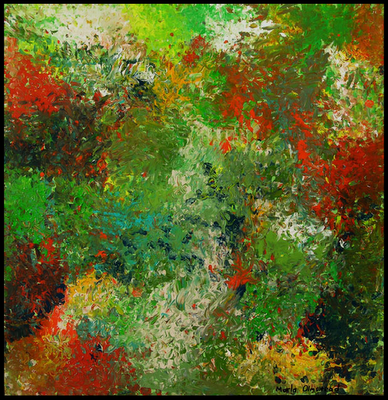 The show’s reception, held on ­­­­­January 26th 2012, received positive attention and a great turnout of guests. Attendees had the pleasure of mingling with featured jewellers and spent the night enjoying wonderful art, music, and refreshments. 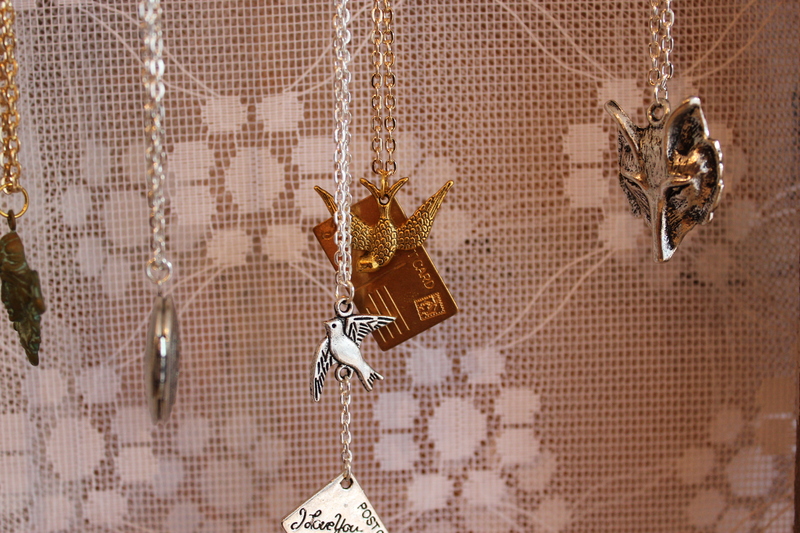 The collection from Fierce Deer Designs by Kate Swan has attracted a significant amount of interest. 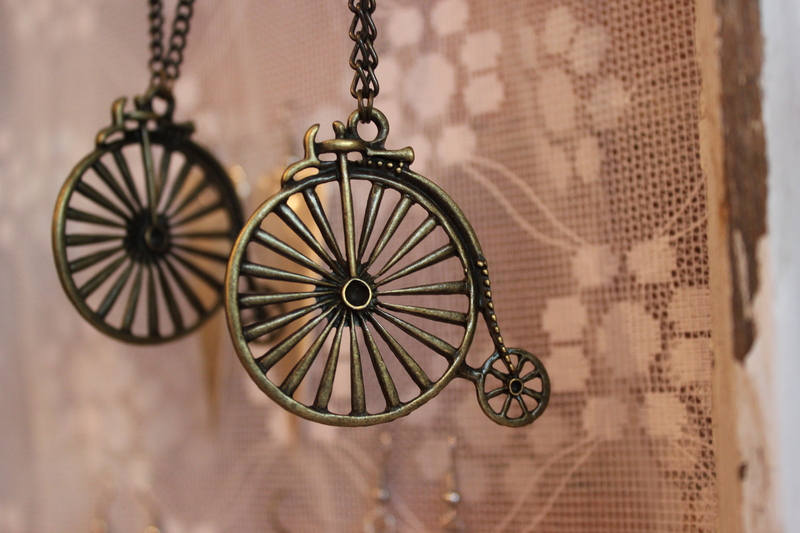 Her unique metal pendants feature charming shapes such as feathers, unicycles, postcards, and keys, crafted with lovely details. 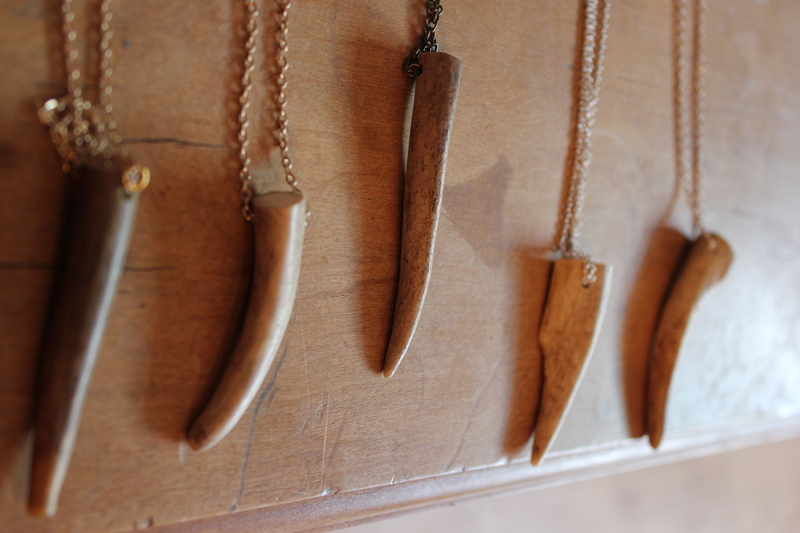 She also creates necklaces using naturally shed deer antlers. 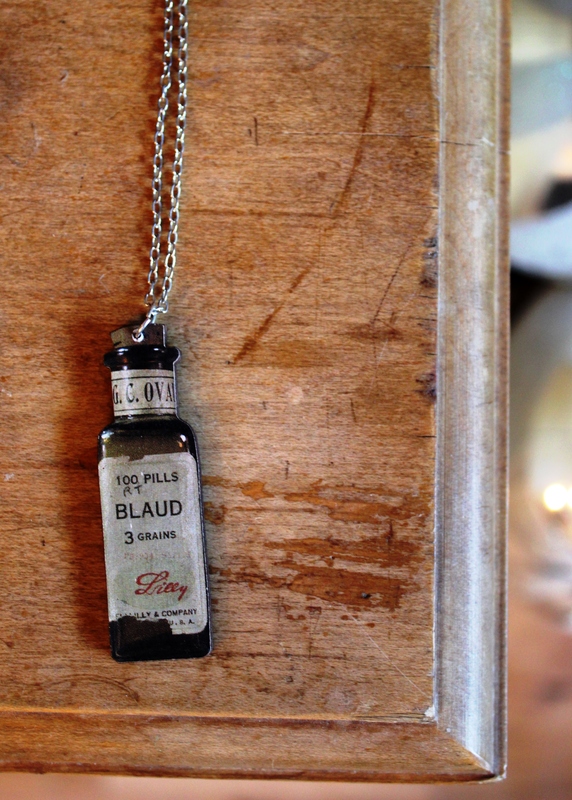 Each cruelty-free antler pendant is entirely unique, and possesses a natural appeal. These are a universal favourite, for their sensual simplicity and raw beauty. 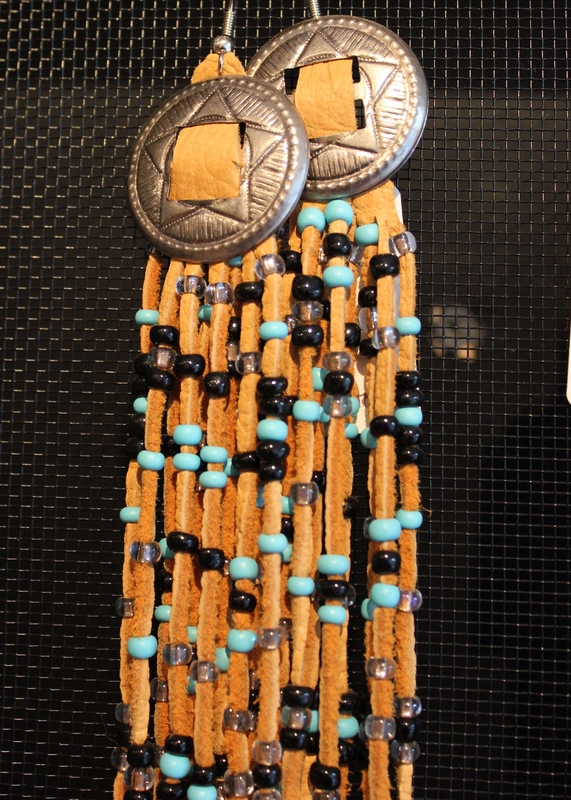 Our very own Norman Felix Artist, Jackie Thinel, is showcasing her elegant earring collection. 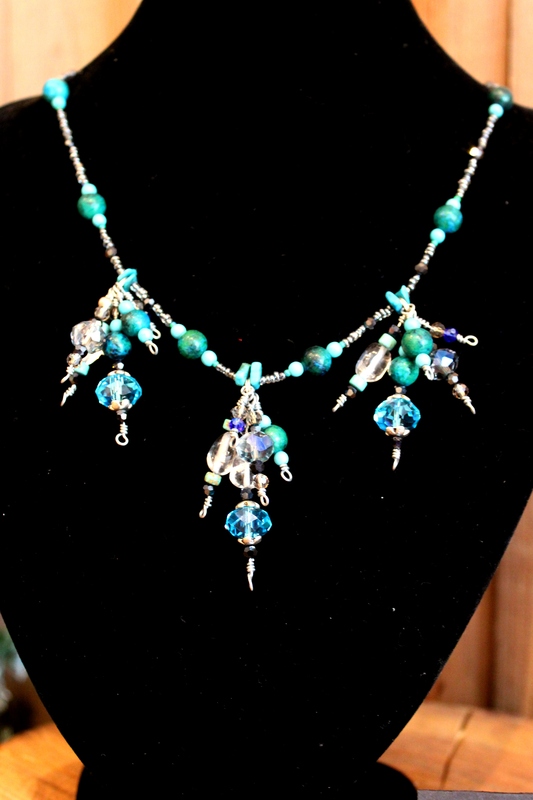 Each long, dangling set is made from fine leather and eye-catching beads. 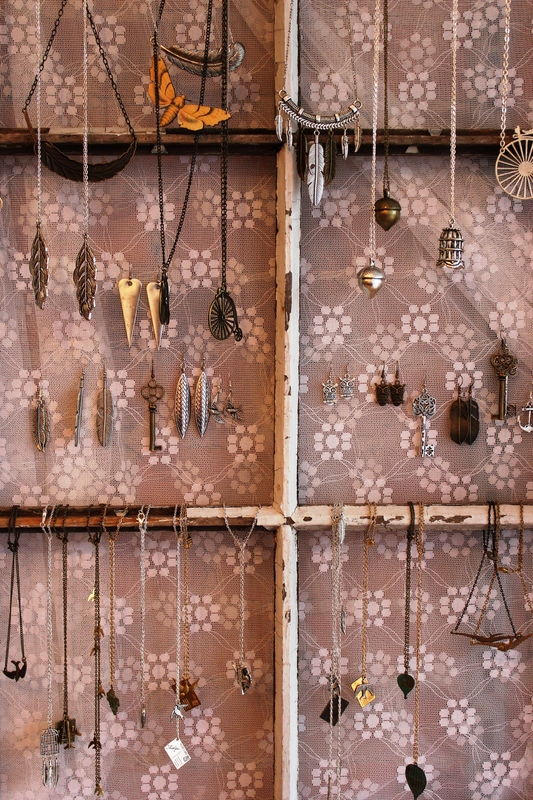 On the opposite end of the spectrum, Nava Haus offers a quirky collection of necklaces with colourful skull and diamond-shaped pendants. 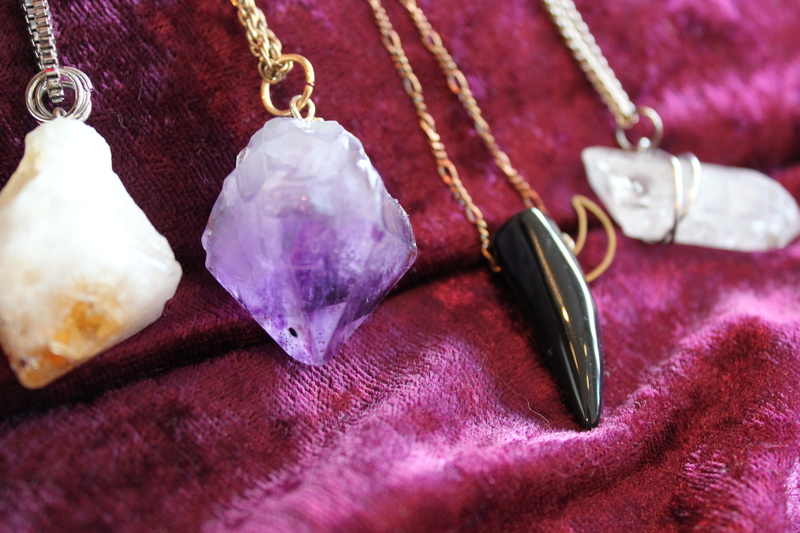 Crux and Luna uses exotic materials such as onyx, jade, bismuth crystal, and quartz in their necklace pendants. These are shaped into cubes, fangs, skulls, spheres, and other eye-catching geometric shapes. One of my favourite pieces of theirs is a simple gold acorn hung on a triple chain. You may have already heard of talented young Toronto custom jeweller Cameron Alexander (Cameron Shahbazi), who was featured in this month’s issue of Grand Magazine. 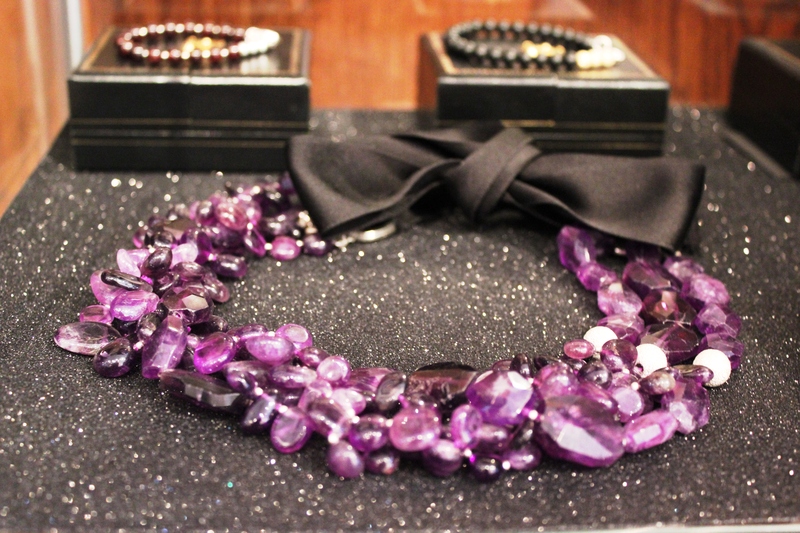 A number of his elegant pieces are on display at the jewelry market, most notably a decadent amethyst necklace and several beaded sterling silver bracelets. Cameron’s love of beauty is visibly apparent in his work, which is impeccably designed and crafted. 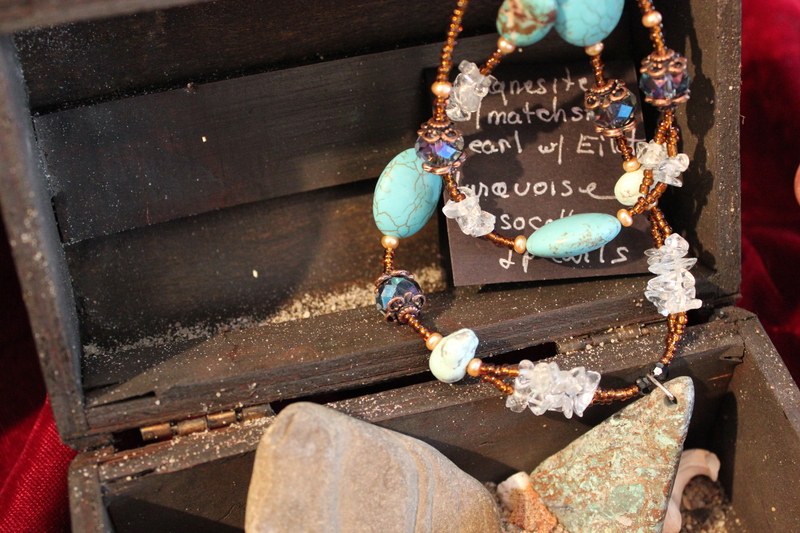 Luxurious jewelry by Diane Victoria features striking gemstones, pearls, fossils, and antique wood salvaged from a shipwreck that occurred more than a hundred years ago. 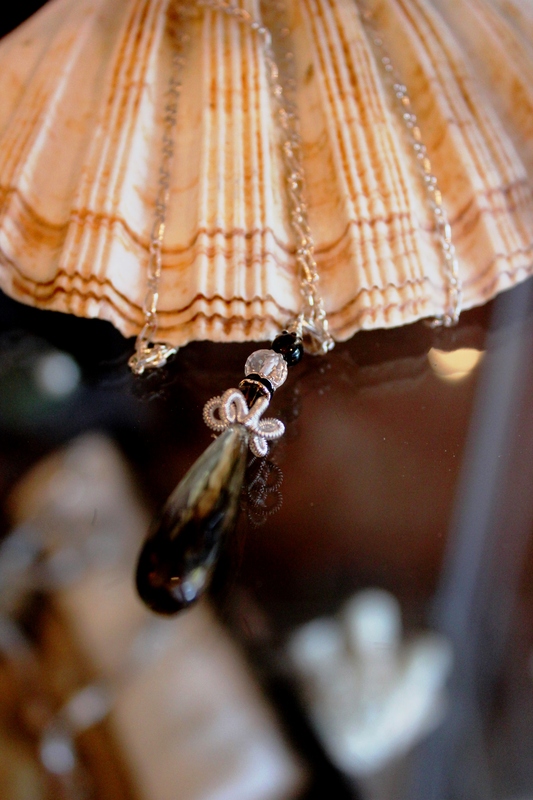 Her pieces are delightfully whimsical, many of them fanciful enough to belong in a fairytale. 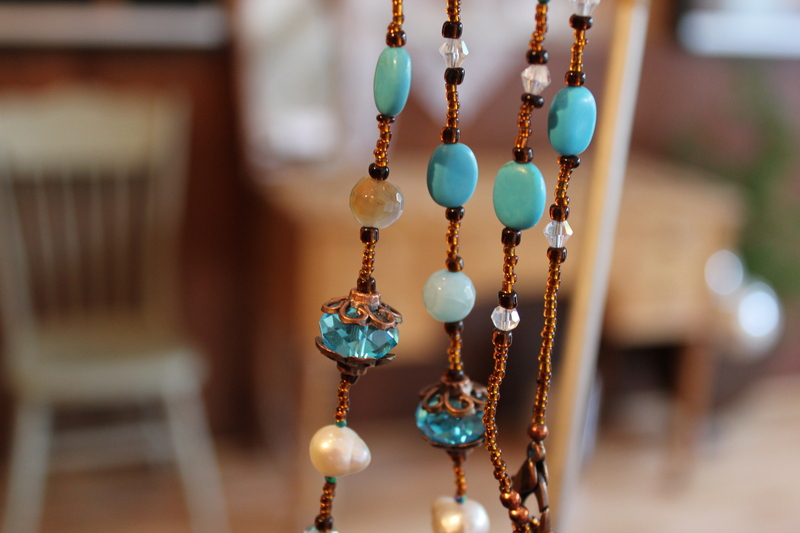 The intricately crafted earrings, necklaces, and pendants by Hip Cricket feature semiprecious stones and delicate accents. 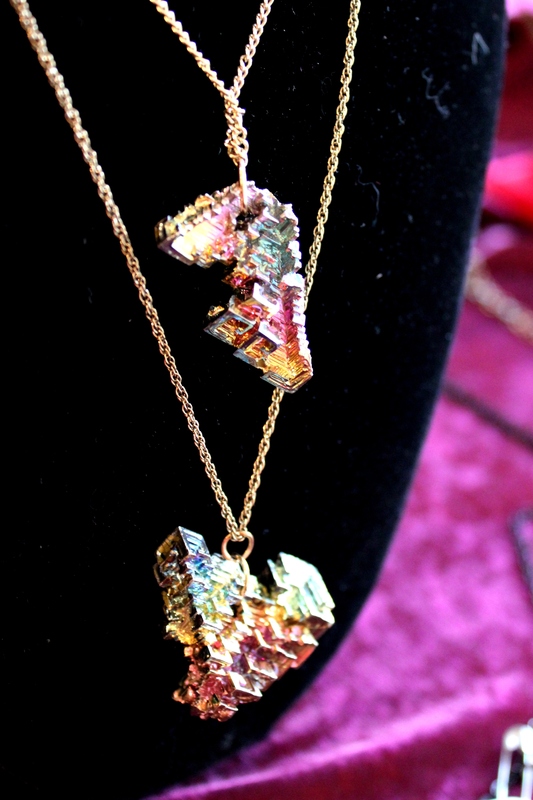 The collection offers a variety of lovely statement pieces. Beaded bracelets with subtle skull motifs stand out in an chic tribal-inspired collection by FortyFourohtwo. And of course we can’t neglect Toveren (the Dutch term meaning “to practice witchcraft”). Their handcrafted pieces are bewitching intersections of leather, metal, crystal, and sometimes bone, the very embodiment of elegance with an edge. A further list of noteworthy jewellers participating in the Jewelry Market includes: Aux Contraire, Raven & Pearl, Andrea Nellis, and Jewelry by Jaylen. 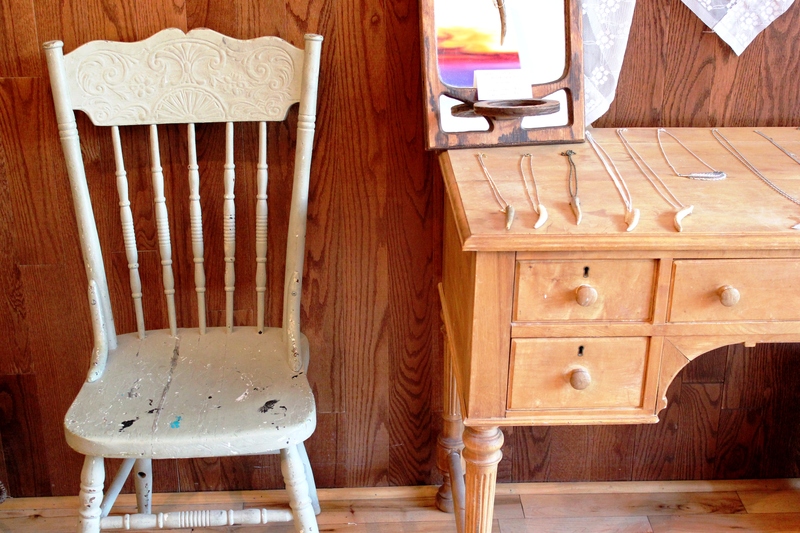 We encourage you to come by and select a piece for yourself or for your special someone before the market comes to a close on Valentine’s Day!